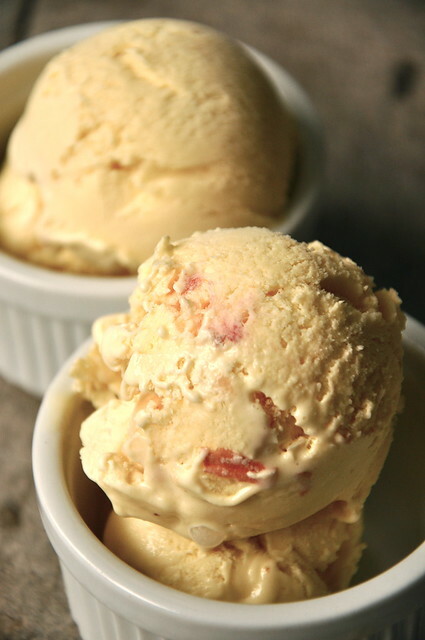 One of the first things I remember making, apart from the occasional hand I lent in making Christmas cookies, is peach ice cream. When we lived in Chicago, our near nightly outing was to Homer's, an ice cream parlor and greasy diner-type restaurant in Wilmette. Without fail, I'd head straight for the Chocolate Chip Cookie Dough or the Oreo Cookie. 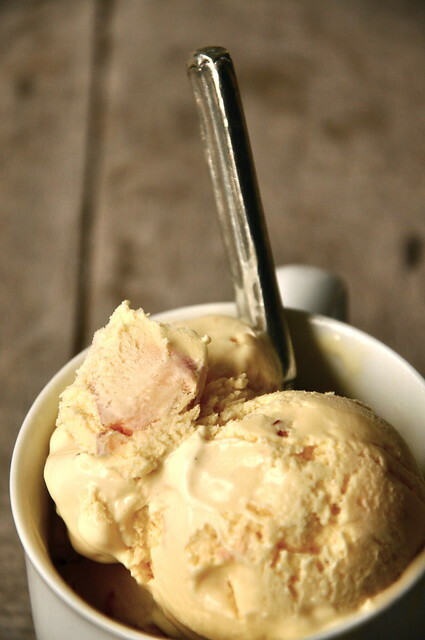 My highly sophisticated palate only occasionally branched out to Peppermint Stick, which, to this day, remains my favorite ice cream in the whole world. I wanted nothing to do with Cappuccino Chip, I snobbily eschewed the Burgundy Cherry, and I balked at the mere thought of ordering Prairie Berry. 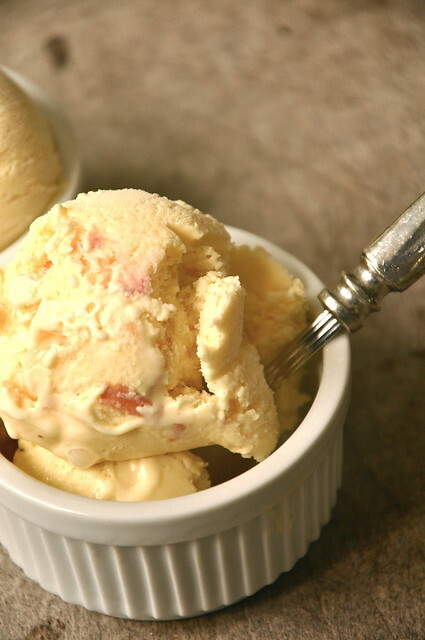 Who in god's name would put fruit in ice cream? Ick. After we moved away, I always found myself pining for a cone piled high with Homer's. My dad, though he claims to have escaped the curse of a sweet tooth, was clearly having withdrawal from his favorite flavor, Fresh Peach. Being the daddy's girl that I was (am? ), I took matters into my own hands. After all, I couldn't leave my dad without dessert. 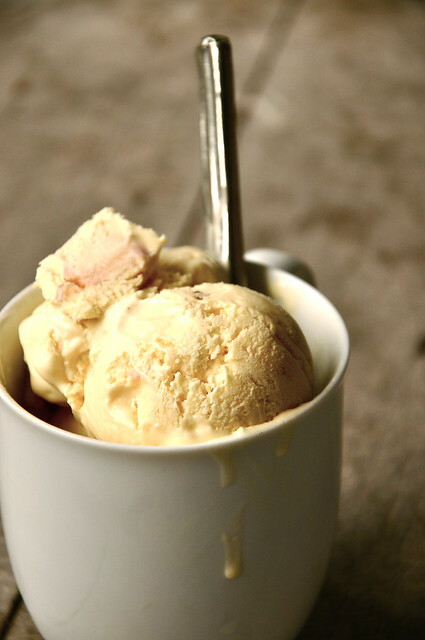 I rifled through my cabinets and pulled out the Ben & Jerry's cookbook that had been accumulating dust for years and found a recipe for peach ice cream. For a seven year old, I did a pretty damn good job. I didn't have the patience to let my custard thicken enough and surely haphazardly dumped in the peaches whenever it struck my fancy, but it did the trick. Since my early days in the kitchen, I'd like to think I've honed my skills. I now wait for my cakes to cool before icing them, I don't beat my cookie dough into submission, and, if I do say so myself, I've been churning out (no pun intended, hehehe), some pretty stellar ice cream. And this bad boy is no exception. In a small saucepan, heat buttermilk and sugar until sugar dissolves and mixture is warm to touch. Gradually whisk some of buttermilk mixture into egg yolks. Scrape warmed egg yolks back into saucepan. Stir in vanilla extract. Stir mixture over low heat until it thickens enough to coat the back of a wooden spoon. Meanwhile, pour heavy cream into a large bowl. Strain custard through a fine mesh sieve into heavy cream. Stir together. Place bowl in fridge until mixture is completely cool. 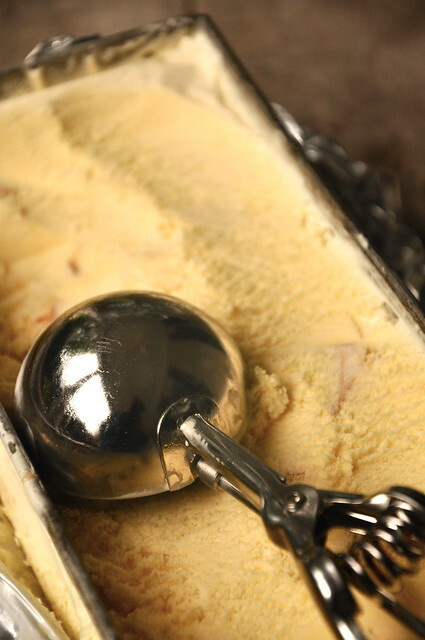 Once cool, freeze mixture in an ice cream maker according to the manufacturer's instructions. Fold in diced peaches and freeze until ready to serve.